When I was a kid, my parents bought me a microscope. It was a very simple compound microscope that wasn't that good but nevertheless, I spent a lot of time mucking around with it. I found all the things in pond water quite amazing. I've been holding off getting a microscope for my own kids until the time seemed right. Indeed for young children, just a magnifying glass is best. There are basically two kinds of microscopes. Low-powered stereo microscopes and high-powered compound microscopes. A stereo microscope is recommended as a first microscope for children since you don't have to prepare the specimen you want to examine and their relatively low magnifying powers means children can readily make sense of what they're seeing. It's also easier to operate. I've been casually looking around at microscopes for a couple of years but I finally found this Meiji EMT stereo microscope on ebay and won the bid for it. It just does 10x and 30x magnification. I'm really pleased since I got it for a great price compared to what a brand new one sells for. Meiji is the third largest Japanese manufacturer of microscopes and seems to be well regarded. The microscope boffins on the Internet all seem to agree that one should buy a second hand top brand microscope rather than the obscure (typically chinese) models. You certainly should avoid microscopes sold in toy stores. The very best brands seem to be Olympus, Nikon, Zeiss and Leica. Lieca owns the Leitz, Wild brands. Basically, the idea is to buy an entry level model from a brand that is commonly used in research labs. Their optics and build quality are stellar. You don't need to buy it brand new. Microscopes have a very long lifespan; it's not like they wear out much. The main issue is accessories and spare parts. So buying a top brand model that is a few decades old is perfectly fine. 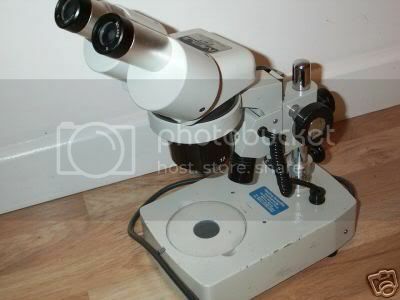 Even the microscopes from the 50's and 60's can still be very good and are much sought after. The kids had no problem figuring out how to use the stereo microscope. We've just started by looking at household items like coins, pens, tissues, leaves and dead bugs covered in dust found in our lamp shades. It should be fun as we find more insects in the spring time. Meanwhile, I can feel myself getting addicted to ebay. I'm trawling it for a good bargain on a compound microscope so I can show the kids the interesting things I discovered in pond water so many years ago.